Benefit has launched Always In The Mood Miss Gina, a new addition to their Crescent Row collection. Like the prior fragrances in the series, it is based on a fictional resident of the fictional Crescent Row. Always In The Mood Miss Gina is a summer citrus variation on the 2009 Crescent Row fragrance My Place or Yours Gina. I have not seen a list of notes, but Benefit describes it as 'fiery and intense' (the notes for the original were pink pepper, bergamot, tangerine, peony, wild raspberry, lily, patchouli, tonka bean and vanilla). 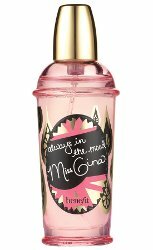 Benefit Always In The Mood Miss Gina is available in 30 ml Eau de Toilette.